Cruise ships dock at Hilo port, which is located just a few minutes from town. Cruise passengers are often greeted by a show put on especially for their arrival where traditional Hawaiian music and dancing can be enjoyed as well as the sale of souvenirs. The gangway ramp is 2 miles from town center. It is possible to walk but part of the walk goes through industrial areas and also can be hot (or wet if it is rainy) with very little shelter or shade along the way. It is a little over 2 miles one-way and if you like to walk bring a hat or umbrella and please be sure to wear sunscreen. Catch the County Mass Transit bus (called the "Hele On Bus"), which you can pick up on Kalanianaole St. just outside the main entrance of the dock. The bus is $1.00 and will be marked "Keaukaha" and can be picked up across the street next to the green building where Keaukaha Market is located. The Mooheau Bus Station is in Downtown Hilo and is the last stop so just stay on the bus until you get to the station. Morning pick up times at the market are: 7:50, 8:50, 9:50 and 10:50 then afternoon times are 1:25, 2:25, 3,25. No buses on Sunday. A metered taxi shouldn't cost you more than about $12 - $15 from the dock to Downtown. The reason you see many passengers at Walmart is that they have a free shuttle that goes back and forth between the cruise ship dock and Walmart, so people use it as a way to get into town and back to the ship, and while they are there they pick up needed sundries and inexpensive souvenirs. Nestled on the crescent shaped shore of Hilo Bay, this beautiful port is an exotic greenhouse of lush tropical plants and abundant waterfalls. Hilo is the gateway to the Volcanoes National Park, a natural wonderland and site of the vast Kilauea Crater, the world's most active volcano and home of the Hawaiian fire goddess Pele. Snow-capped Mauna Kea and Kilauea Crater tower dramatically over the island of Hawaii. The downtown area of Hilo contains Hawaii's largest collection of historic buildings, dating back to the turn of the century. There are plenty of restaurants, museums, a rain forest zoo and the beautiful Nani Mau Gardens to explore. Beyond the city itself the countryside is photogenically beautiful, with waterfalls plunging down the hillsides, forming rainbows that light up the lush vegetation. It rains a lot, but mostly in the late afternoons, ensuring that the area stays vividly green. The volcanic beaches in the area are covered in jet-black sand, offsetting the brilliant white spray and blue, glassy waters. Hilo is a colorful kaleidoscope of Hawaii, filled with friendly, smiling people waiting to welcome visitors. There is also a free event called Hilo Hula Days: 100 Days of Aloha by the Bay, Hawaiian music, hula and crafts in the Mooheau Bandstand next to the station from 11 a.m. - 1 p.m. every day a ship comes in. You can take the public bus to downtown Hilo, Walking to downtown Hilo is about 2.5 miles and takes about 50 minutes. The bus (not on Sundays) cost is $1.00, free for seniors 55 and above; taxi fare from the port to Downtown Hilo is about $12-16. 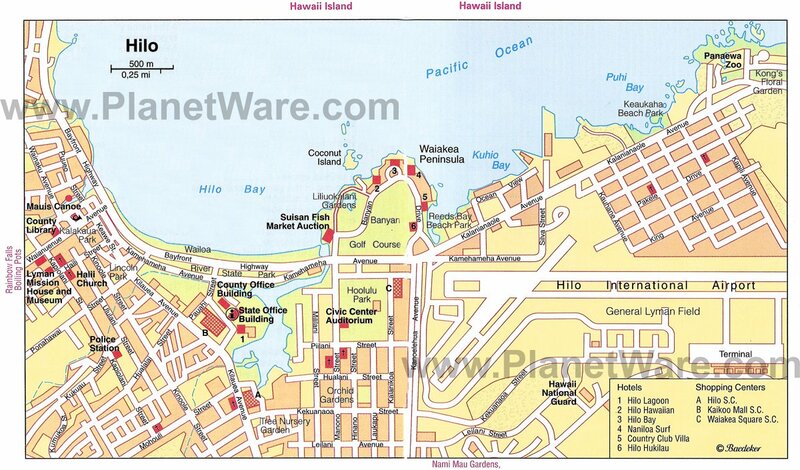 Hilo, the second largest city in all of Hawaii, is very walkable. Walking tour. National Park Hawai'i Today Hawai?i Volcanoes National Park displays the results of at least 70 million years of volcanism, migration, and evolution in the Hawaiian Island. Walking along the Bay front and visiting the quaint shops along Kamehameha Avenue is fun for browsing and shopping. Hilo also has many shops with extremely high quality printed fabrics that are locally made. The print designs are Polynesian or Hawaiian in style. You can find shops selling the fabrics as well as shops selling the clothing made from the beautiful fabrics. Many stores are closed on Sunday. Hilo Farmer's Market: Every Wednesday and Saturday, you can visit the Hilo farmer's market. Here you'll find an abundance of amazing fresh produce, things to snack on, and native crafts. A free shuttle is available.